Out of stock since Sunday, 3 February 2019. Due back soon. Out of stock since Wednesday, 20 September 2017. Due back soon. Hilton Herbs Multiflex is a supplement for horses containing extracts from plants which promote joint and mobility health. This can be added to the food once daily for older horses. Hilton Herbs Multiflex is a tried and tested formula that helps your horse or pony maintain supple joints, muscles and optimum mobility whatever their age. Hilton Herbs Multiflex supplements are added to the feed on a daily basis, if possible splitting the required amount between two feeds. The liquid supplement could be given direct into the mouth (by way of a syringe) which can be useful if no feed is given during the Summer months. The amount of herbs you need to give is generally dependent on the height of your horse, with some allowance for type. Full instructions will be found on the packaging. The quantity of herbs added to your horse or pony's feed can be slightly increased or decreased, depending on the circumstances. Very often a lower maintenance rate can be sufficient for a horse or pony that is going to be kept on the herbs long-term. Remember, like humans, all horses and ponies are individuals. 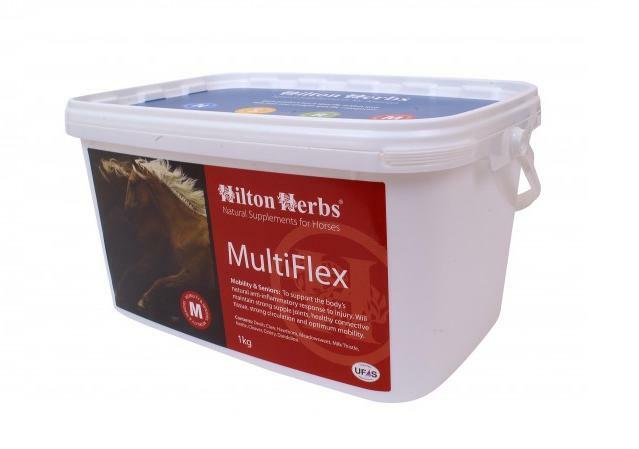 There are currently no questions for Hilton Herbs Multiflex for Horses - be the first to ask one!